Prequelle1. Ashes2. Rats3. Faith4. See The Light5. Miasma6. Dance Macabre7. Pro Memoria8. Witch Image9. Helvetesfönster10. Life EternalBuy now from AmazonPlease be seated. You are about to receive the fourth sermon from twisted Swedish clergymen Ghost. But first, some background for the heathens: after every album, the band ‘change’ singer. Papa Emeritus III was removed last year, and a new emissary called Cardinal Copia was installed by the mysterious holy order. Meanwhile, in the real world, freshly unveiled frontman Tobias Forge has been embroiled in a lawsuit with his former backing band of masked ‘nameless ghouls’ – but that outside turmoil hasn’t dimmed his creative vision. Prequelle is a dizzying, all-consuming rock opera delivered with convincing evangelical zeal.The stage is set with creepy intro Ashes, a reworking of the classic plague rhyme Ring A Ring O’ Roses, before Rats digs its claws in with the biggest hook since Square Hammer. Despite its medieval theme, the music is a homage to the 80s, as with much of this record. The band have long enjoyed a love affair with the era (most obviously on their If You Have Ghost and Popestar EPs, featuring covers of Roky Erickson, Eurythmics and more), with major chords and warm production bumping up against grotesque, devilish lyrics. The religious rapture of third track Faith is offset by insidious whispers and an almost subliminal horror-movie laugh, nailing that schlocky vibe Ghost do so well, walking a line between parody and thrills. Organ-augmented ballad See The Light combines gentle worship with Holy Communion metaphors about rotting flesh.But the most perfect culmination on this record is in Pro Memoria; its sweet string, piano and choral melodies rain down like beautiful blessings, while the catchy vocal refrain bears the message: ‘Don’t you forget about dying, don’t you forget about your friend death’. Cheers, Cardinal Copia.Bombastic grandeur aside, Prequelle takes some surprising turns, including two proggy instrumentals. The none-more-retro Miasma subliminally recalls Majestic from last album Meliora and sounds like an extended action sequence, climaxing in an enthusiastic saxophone solo. Meanwhile, Helvetesfonster is like a reprise of Pro Memoria combined with the theme tune from The Hitchhiker’s Guide To The Galaxy. Though disarming on first listen, they cleverly connect Ghost songs past and present, and make the record feel like a grand musical. It’s easy to imagine how these interludes might work onstage – maybe even during set changes – for this most theatrical of bands. Now they’ve headlined Bloodstock, is Broadway next?The repeating refrains breed familiarity, so the album is full of proper earworms beyond the choruses, adding a layer of seductive subtlety to a deliberately over-the-top album. Cultish closer Life Eternal is a mellowed-out grand finale – a moment of ‘just letting go’ that even includes a sparkly shooting star sound. The whole record brims with a nostalgic yet timeless affection, not to mention a huge sense of fun, and a dose of escapism that’s badly needed in these turbulent times. It’s a faith-healing session run by a perverse preacher. It’s Jesus Christ Superstar made over by Satan. It’s their most fully realised statement yet. 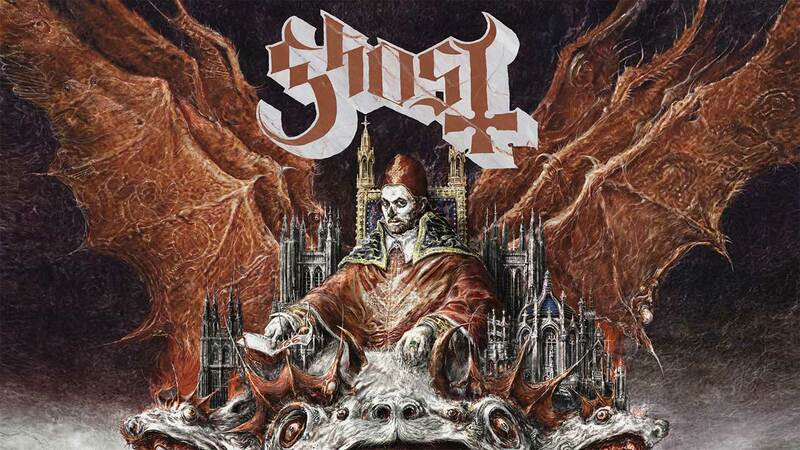 And so, in the year of our lord 2018, Ghost have delivered Prequelle. And lo, it is good.